The product weighs 157 lbs. and may require the use of a lift gate. If you do require a lift gate at your delivery, you'll have the option to add this FREE of charge when you checkout. This LG unit may qualify for a tax credit or rebate in your area. Search your zip code in the link below for information about rebate programs that apply to you. 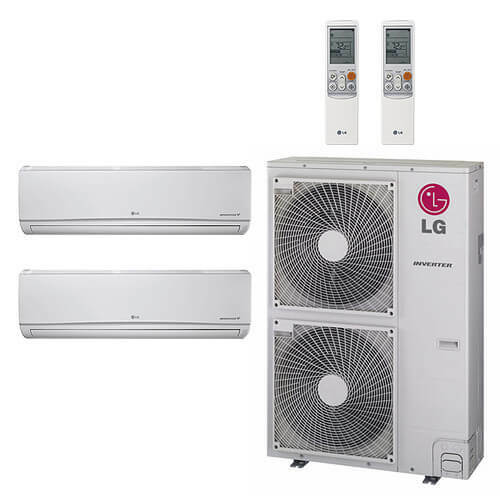 LG Ductless Air Conditioning Systems offer convenient solutions that are cost-effective, quiet, and attractive. These innovative systems are split into two efficient units. The wall-mounted interior unit is slim, lightweight, and aesthetically pleasing. The larger, Flex Multi-Split systems operate two, three or four interior units that are mounted in separate rooms. Each indoor unit comes with its own remote control, allowing the homeowner to set the temperature individually in different rooms. These units are connected to a single exterior unit. We recommend the installation of all LG Ductless Split Systems to be done by a licensed, trained & qualified HVAC technician with the proper knowledge and background. A trained technician will be able to judge the best location for the air handling (evaporator) unit and also the correct size for the area it has to cool. Should you experience an issue during the installation or the initial startup of the unit please do not contact the manufacturer. You should have the technician that installed the units contact us or the manufacturer. LG cannot accept any service or warranty calls from anybody but a licensed HVAC technician. Neither we or LG Electronics U.S.A. can be held liable for improper installation and operation of any LG air conditioning product purchased from our company. Should a warranty issue arise where parts will need to be replaced, an installation receipt will be required along with your sales receipt. Failure to provide a receipt or invoice may result in the warranty not being honored. Note: Warranties on mini split air conditioners only include parts and do not include labor. The licensed HVAC Technician who installs your air conditioner should always provide you with a labor warranty (preferably for a full year to compliment the manufacturers' parts warranty).